This lithograph is taken from plate 21 of 'General Views of Lucknow' by Sir DS Dodgson. 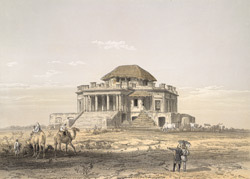 According to his account, this building was one of the key battlegrounds in the fighting in Lucknow that accompanied the Indian uprising of 1858. It is most likely part of the Chattar Manzil complex, which was referred to as the Chaurukhi Kothi or 'four-faced building' since each of its facades was built in a different European style. The rebel Indians made a desperate stand here against the British attempt to recapture the city of Lucknow. The building was finally stormed and taken on March 8 by troops under the command of Sir James Outram. After the capture of this Kothi, the rebels were driven back to the fortress of Badshah Bagh, which was itself soon taken.